Dispatched to be a “pet” puppy to an unknown but highly-recommended couple, we all look back now with a giggle! “ZigBee” although first and foremost a “pet” proved to be a whole lot more than that and excelled in many fields. In the capable hands of Toni Sibrel and Pete Bojan, he completed his Championship with Toni by his side learning all the way in her first venture into the show ring. He modeled continually for the “Howl O Ween” contests, tried his paw at herding, and did exceedingly well in agility. Versatile guy! 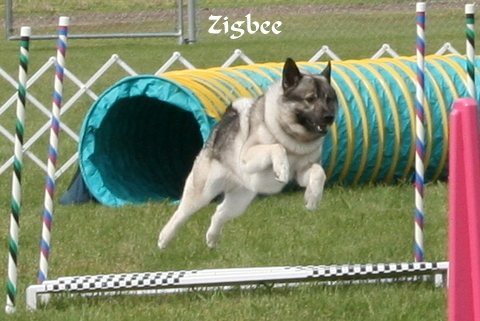 ZigBee earned a number of agility titles with Toni and in 2013 was invited to the AKC Eukanuba National Agility Championships, placing 4th highest scoring Norwegian Elkhound overall as well as Top Scoring Norwegian Elkhound with a Conformation Title. You'll always be in my heart, my friend.